This tutorial will teach users of Facebook how to create personal lists which are crucial to controlling who sees your posts along with determining what you see streaming down the NewsFeed. The lists also enable you to instantly see activities of categorised groups of friends as though in a mini-NewsFeed. First of all, Facebook by default provides two lists: Close Friends and Acquaintances. Putting Facebook friends in either category allows the user to interact more with real-life friends as opposed to those the he or she knows only casually or never even met outside of the social network. A user sees more of a friend in the NewsFeed if he or she is in the Close Friends list. 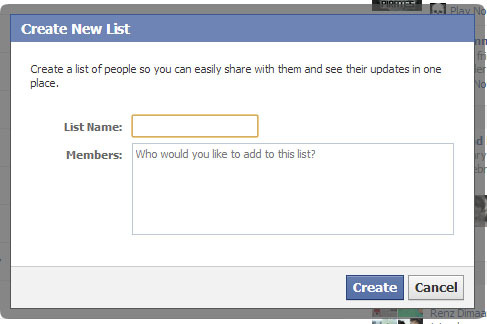 Opposite to this, the user sees less of a friend in the NewsFeed if he or she is in the Acquaintances list. A user may also create his or her own lists. Here is how it is done. Refer to the left sidebar of the NewFeed or Home Page where you find Favorites, Ads, Pages and Groups. Scroll down to the list of Friend lists. Drag your mouse and over the word Friends to bring out the clickable More hyperlink. Click on the word More to bring out all existing Friends lists. Click the Create List button to bring up the pop up window. Type a name for your list in the List Name form box. Start typing the names of friends whom you wish to be part of the list in the Members form box. Facebook will conveniently show a list of friends to choose from. Choose your friends from among the options and then click ‘Create’ to complete your list. That’s it! You have created your first personal Facebook list!